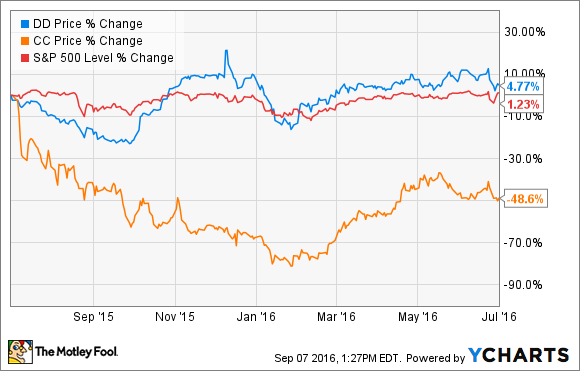 Was Chemours 42% Stock Jump in August a Sign of Better Things Ahead? Chemours stock has been languishing since it was spun off from DuPont in 2015. But in August, it surprised everyone by jumping more than 40%. What's changed? Chemours was spun off from chemicals giant DuPont last year. Image source: Getty Images. A jump of that magnitude could signify a fundamental shift in the company's fortunes. On the other hand, if it isn't justified, it could be a red flag for investors. Chemours was created in 2015, when DuPont spun off its performance chemicals business, which manufactures titanium dioxide and "fluoropolymers" such as Teflon -- and the legal liabilities associated with those products. From the very start, it seemed as though Chemours was set up for failure. DuPont saw the opportunity to rid itself of some $4 billion in debt through the spinoff and loaded up the new company with five times its EBITDA in net debt. Moreover, DuPont committed the new company to a $100 million quarterly dividend, which would have been a double-digit yield that required more debt to sustain. Finally, Chemours inherited numerous environmental cleanup liabilities and lawsuits from its parent, including an estimated 2,400 asbestos-related lawsuits. Small wonder, then, that investors were dumping the stock left and right. In spite of all the headwinds facing the company -- which also included low titanium dioxide prices because of a glut on the market and an unfavorable spot in the price cycle -- management did its best to right the ship. Rather than take on more debt to fund its generous dividend, the company slashed the dividend by 94% -- from $0.55 per share Q3 2015 to just $0.03 in Q4. It also reduced its workforce and closed some plant locations. Chemours CEO Mark Vergnano said at the time, "Our actions are designed to reduce our net debt position, improve our financial flexibility, and over time, allow us to be in a position to return additional cash to shareholders." Said shareholders, however, weren't impressed, punishing the stock and sending it to below $4 a share in January. 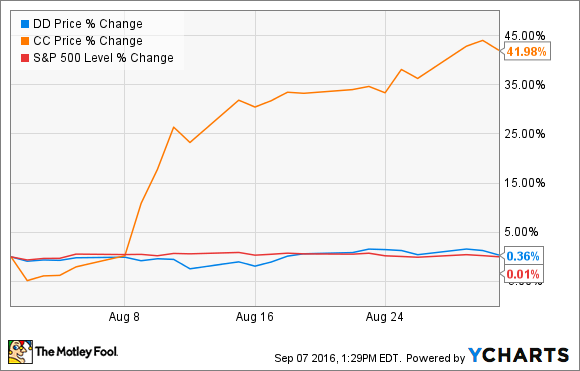 All this explains why analysts were pleasantly surprised by Chemours' Q2 earnings report on Aug. 9, particularly the earnings themselves. The company reported $0.27 in EPS, crushing analysts' consensus estimate of $0.17. However, the company still posted a revenue miss of $40 million. In addition to the noteworthy earnings, the company also reported it had made progress in chipping away at its mountain of debt, paying down $92 million in the second quarter. It had been able to reduce expenses, raise prices on its titanium dioxide products, and grow its Opteon refrigerant business. Free cash flow was positive for a change, and the company maintained its 2016 outlook. All of these positives -- many of them unexpected -- gave the stock a boost in the days after the report, sending it north of $11 a share for the first time in a year. The stock continued to creep upwards throughout the month, finishing above $13. And while some upward movement may have been justified, on the whole, investors should be wary about the stock. Despite this quarter's positive movement -- in stock price and in management's progress toward its goals -- Chemours is still a company with a lot of problems. One major problem is litigation. In addition to the lawsuits it faces over asbestos, it also is a party (along with DuPont) to litigation over PFOAs, which are chemicals DuPont used for years in making Teflon. More than 3,500 people have already filed PFOA-related lawsuits against DuPont. The first one resulted in a $1.6 million judgment against DuPont, which it is currently appealing. If Chemours is held even partially liable for DuPont's PFOA claims, the costs could run into the billions of dollars, on top of the debt and other liabilities with which Chemours is already saddled. We, through DuPont, will continue to defend against these cases in court and work through the mediation process. ... In late July, the judge presiding over the multi-district litigation pulled forward two cases to November 2016 and January 2017. We have begun to prepare for these as well as other potential cases. In exchange for buying into all this uncertainty, investors don't reap much reward. The dividend has been slashed to a paltry 0.88%, compared with 2.19% for DuPont. Profit margins are poor. The stock's recent price gains seem to have stalled out. Chemours is simply too risky today for investors to take this big stock jump as a sign that the company's troubles are behind it.